Vanlife, tiny houses and cabins seem to be spearheading the #Tinyliving movement, and as such have many features in common. Clever uses of space, custom, mostly wooden, interiors, mobility and minimalism are all integral parts, but what if you want something that bridges the gap between van and cabin? What if, say, you wanted the freedom of vanlife, but you’ve always wanted to live in a Swiss-style cabin with your very own sauna too? 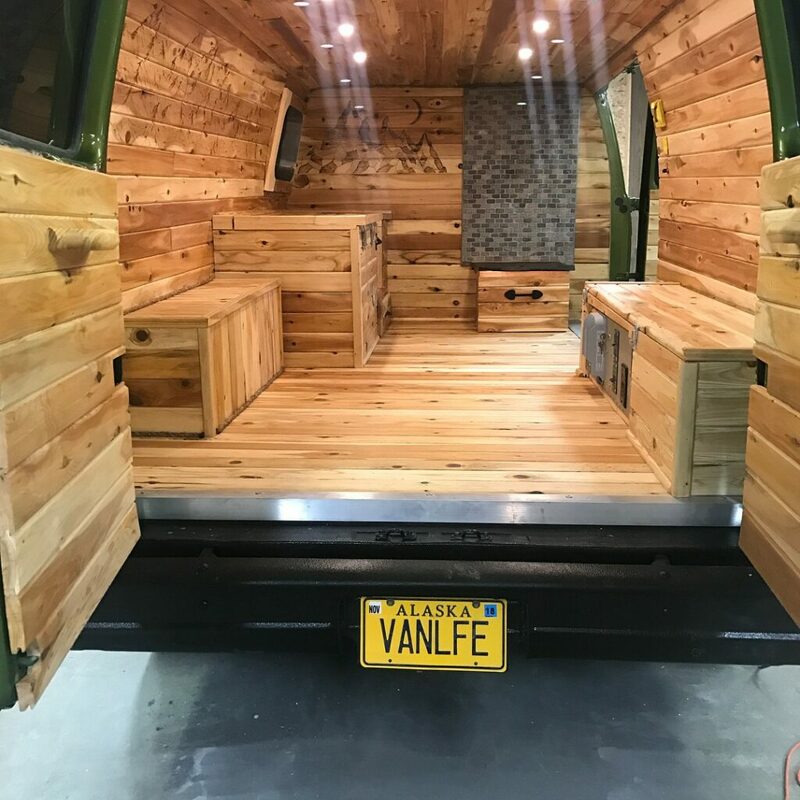 Astonishingly, one company has crafted this vision into a one of a kind van and trailer combination, and thereby created what might just be a world’s first: the Vauna (that’s a van-sauna to you and me). The van, named Hugo, with its matching bright green trailer and pop top roofs. 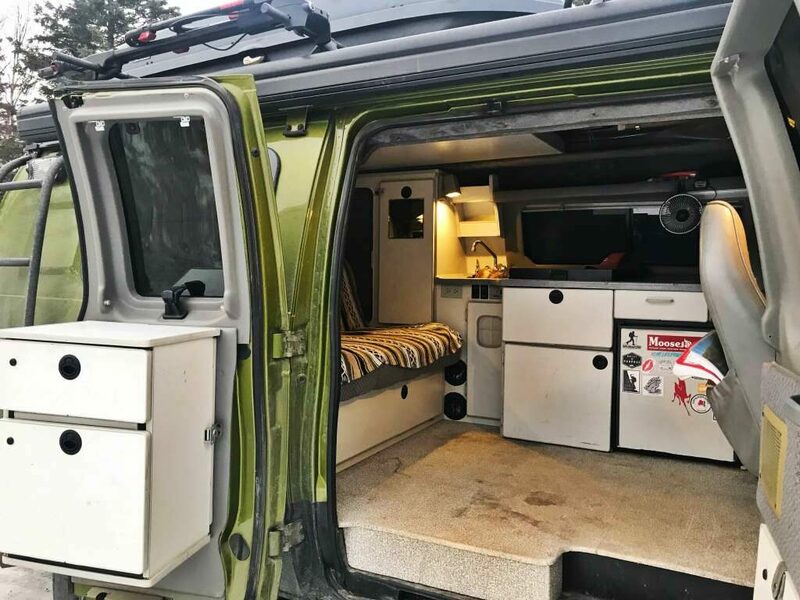 Vanlife can be uncomfortable at the best of times, lacking in luxuries, mod cons and all but the most basic, scaled-down living essentials, but it doesn’t always have to be like that. Maybe you just want to kick back and relax in your very own private sauna, warming up and sweating out after a hard day exploring the wild snowy lands of Alaska. This was the vision of conversion company Sportsmobile, who have lovingly crafted a sauna room complete with cedar panelling and a woodburner in a trailer made from half of a van. Sound crazy? Just a little bit, but the amount of gear and style they have packed into their creation is truly unreal. The trailer was crafted with every attention to detail. The base van is a 2000 Ford E350 with a 7.3L Powerstroke Diesel engine and Automatic transmission. It’s had a Quigley 4×4 conversion undertaken on it, and an Agile Off-Road RIP Kit installed which includes new leaf springs, coil springs and Fox 2.0 shocks, as well as a complete engine service with all new parts, making it perfect for off-road adventures. It’s had a jazzy bright green paint job, and been fitted with Aluminess side ladders, front and rear bumpers, nerf bars, a bike rack, spare tire arm and a storage box. 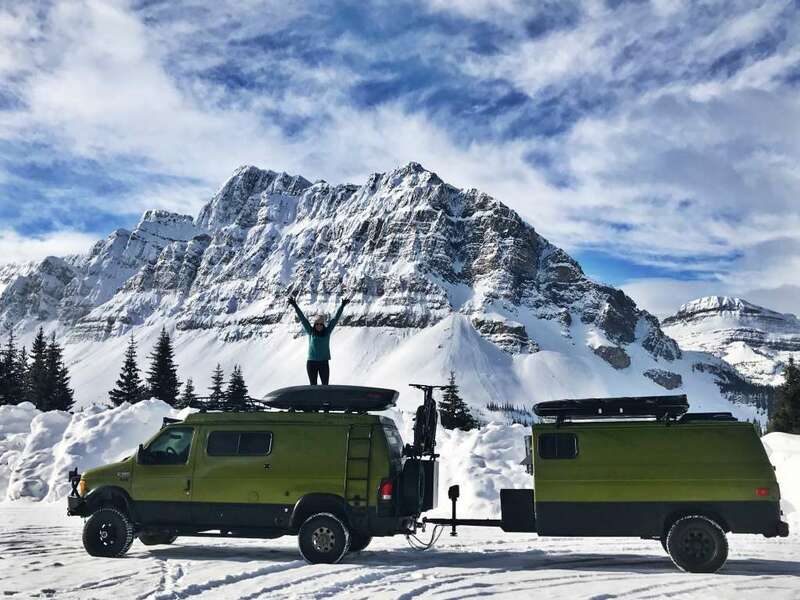 But this is only the beginning of a long list, which includes a Fiamma 45 awning, a Rigid Industries 52” light bar and R2-46 driving lights, Yakima carbon ski box, cargo rack and bike loaders, and it’s even been fitted with remote start and an Arctic package. This van doesn’t just look mean, it’s positively howling to be taken on an adventure. 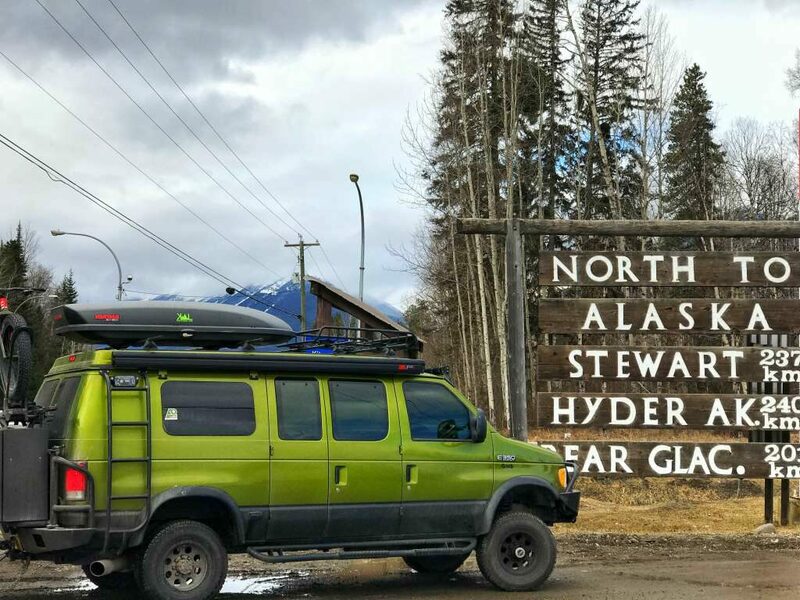 This van was made to spend its days exploring the wild, snowy lands of Alaska. The van’s interior is a fairly standard layout not unlike your typical VW Transporter, with a rock n roll bed and kitchen along one side, containing a two burner propane stove, 12v fridge, a sink and a tap. It’s got a Planar diesel heater to keep things cosy, and a pop-top roof to make things spacious. But all of that pales in comparison to what’s behind the van. Because being pulled behind this van is… another van. Or half of one anyway, sawn in half and converted into a bespoke matching trailer, whose primary function is a sauna. The van’s cosy interior has been expanded with extra cooking facilities in the trailer. To achieve this, Sportsmobile had some serious work to do, stripping the single remaining axle of its ring, pinion and shafts, as well as the yoke and fluid before welding the tubes shut. They stripped the undercarriage of all excess weight, gave the rear axle ¾ ton heavy duty leaf springs, custom fabricated a heavy duty tongue with electric jack and mounted a custom framed front end wall enclosure. Once the external work was done, it was time to create the Vauna. This was done using 2” of spray foam insulation to keep the heat in, and a custom white cedar interior, the wood famously used in traditional Finnish saunas, emblazoned with a stunning mountain range scene burnt into the wood itself, so you can really feel like you’re soaking in the heat amongst snowy mountains. 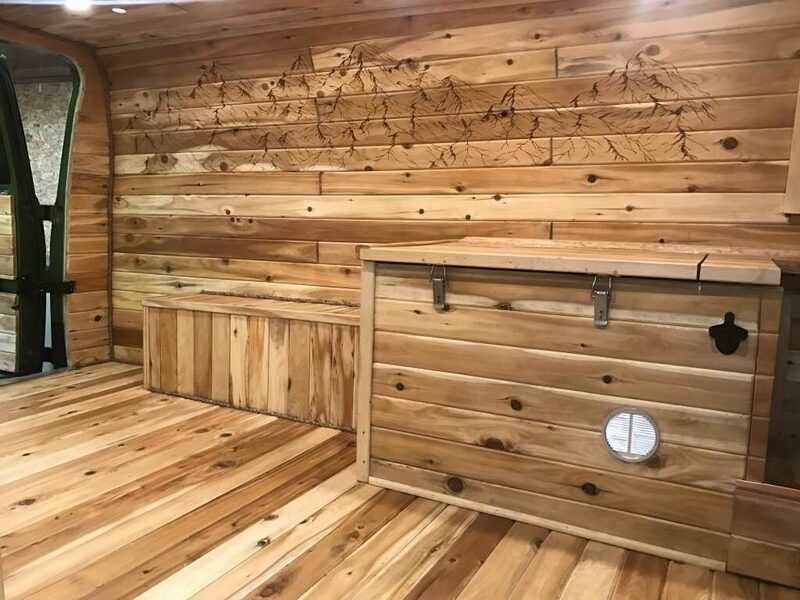 The sauna is cladded with traditional cedar, and features pyrography artwork. But the trailer is so much more than just a sauna; it’s got a James Baroud Explorer XL roof top tent so it doubles as a guest room too. 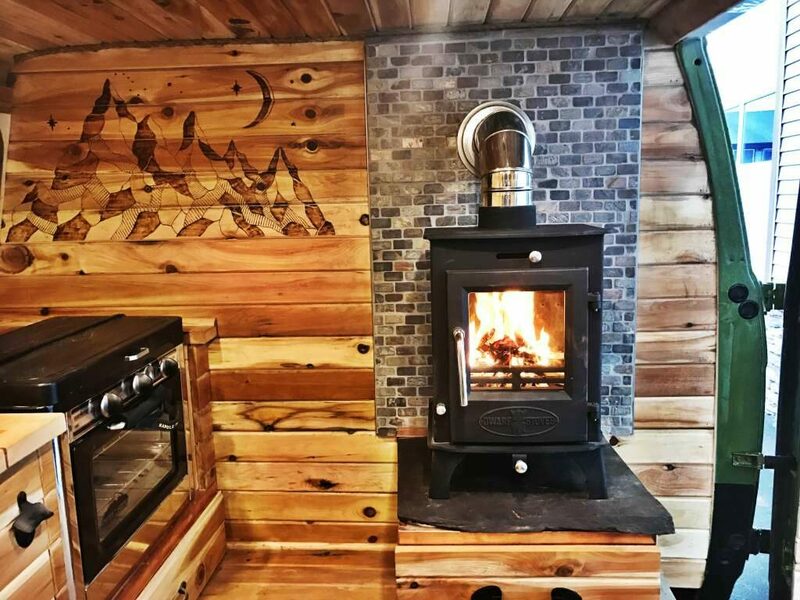 Inside the trailer, you’ll find a Dwarf 4KW wood stove with custom slate hearth and pull-out storage drawers underneath. It’s got its own kitchen with a Camp Chef Deluxe oven with two burner propane range, and a Whynter FM-62qt Dual Zone fridge/freezer with a beautiful custom maple butcher block atop. On the electrical side it manages to pack in two 6V deep cycle leisure batteries, a 100W solar panel, a Krieger 2000 12v Power Inverter, a Marinco 110V Shore Power plug-in with smart 12V battery charger and eight 12V Marine dimmable LED puck lights, to set the mood while you relax. We bet your local bathhouse can’t do all of that. A Dwarf woodburner heats the sauna, and 2″ of insulation keeps the warmth in. At this point you’re probably screaming at your computer screen “Take my money!” but hold on, there’s a catch. Not only is this a completely unique, one-off build, but the van has also clocked up a slightly eye-watering 258,000 miles. The seller does insist that with proper maintenance a 7.3L Powerstroke engine can easily do over double this, but can the price of $85,000 really be justified? For your own personal sauna that can be enjoyed virtually anywhere in the world you decide to park it, the answer could well be yes. Just make sure you’re parked near a river or a lake; you’re going to want a refreshing dip once you’re done sweating it out. 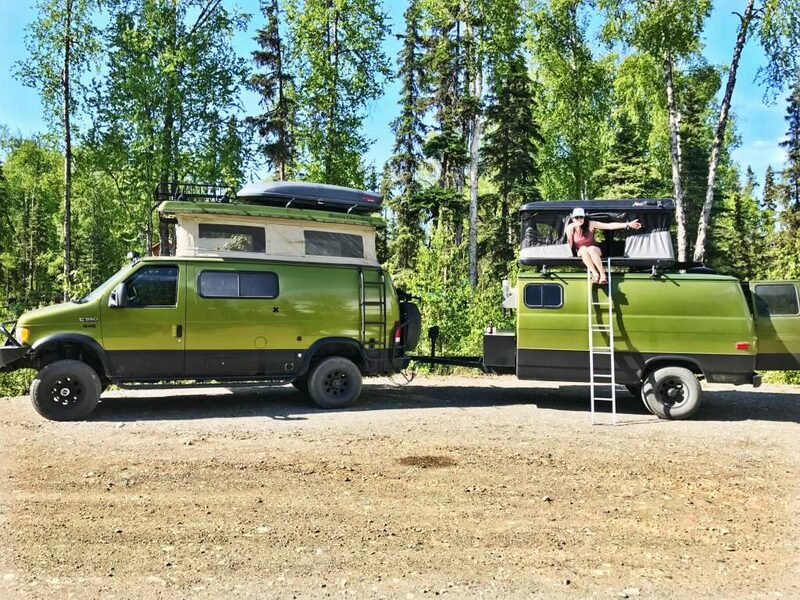 The Vauna can be seen, while it’s still available, on Conversion Trader, or if you’re interested you can see exactly what went into building Hugo the Big Green Van and his adventures around Alaska on Instagram.